Liverpool boss, Jurgen Klopp, has told his players to cut off supplies to Neymar in order to give them the possible chance of beating Paris Saint-Germain. Kloop is preparing his men for their first Champions League match of the 2018/19 season, having enjoyed a perfect start in the Premier League. That perfect start is likely to be tested on Tuesday night, with PSG visiting the Anfield having won their first five Ligue 1 matches this season. 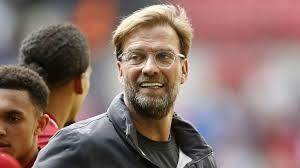 With the likes of Neymar and Kylian Mbappe, Liverpool will do well to maintain their unbeaten run, but Klopp is hoping that his side will remain true to themselves while keeping the ball away from the Brazilian. When asked about Neymar’s on-field theatrics, he responded, “I saw a few games at the World Cup when it looked like he made a bit more of the situation. “That’s a completely normal reaction because players are really going for him. That’s the truth. “He has to protect himself. If the opponent gets a yellow card he is closer to a red card. It is smart. “We don’t go for him against us. We want to play football. We want to win the ball. We don’t try to act on these types of things. “We try to avoid passes to him. It is a big job. I don’t know if it’s possible to avoid his quality. I’m pretty sure it’s not. “He is an outstanding player. He was not fit at the World Cup. He tried to play for his country without being fit. I don’t think he’s a person who wants to act because if you do that you cannot play the football he plays.